Today, the day after American Thanksgiving is traditionally known as 'Black Friday'. It signals the unofficial start to the holiday shopping season. Stores in the States typically open in the early hours to allow for the crazy crush of shopping shenanigans to get a head start. Back in 1992, this day following Thanksgiving also became known as 'Buy Nothing Day.' 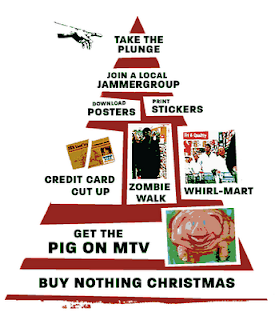 In a response to the buying bonanza of Black Friday, Buy Nothing Day urges people to put down their credit cards and refrain from the rabid course of consumerism -- at least for one day. Typically the shoppers out number those souls who choose to keep their wallets firmly planted in their purses -- but this year with all the economic woes, perhaps the Buy Nothing folk will have more followers? Well, obviously the movement is catching -- Buy Nothing Day is also noted in the UK and elsewhere around the globe. Can't say that I participated in 'Buy Nothing Day.' Hey, I was in NYC so you "have" to buy something! So I did...and Macy's was crazy even in the afternoon but the visit was worth it. Got my Horton the Elephant, star of this year's Macy's Parade. That in itself was worth risking life and limb on Black Friday in NYC.